The House of Neptune and Amphitrite has some of the best preserved and spectacular mosaics and wall paintings in the town. It demonstrates how the owner adapted a relatively small space to display all the features of an elite roman town house. The house is located in Insula V, cardo IV of Herculaneum. It is fronted by a caupona which was attached to the house by an interior door, suggesting both properties were owned in common. The house of Neptune and Amphitrite is of quite a modest size occupying an area of only 227m squared. However, its owner was clearly wealthy and made use of his house’s layout and decor to show his social standing off to best effect. Despite the modest size of the building, the wall paintings and mosaics are of a high status house. They are executed with taste, demonstrating that the owner was both wealthy and cultured. Many of the wall paintings and mosaics are missing or damaged. This is because the house was one of the earliest properties to be targeted by bourbon excavators who were intent on raiding the site for its work of art. 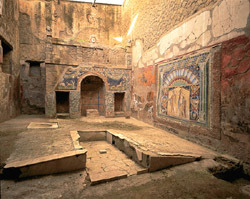 Areas of the house such as the lararium were damaged by the tunnelling and many of the wall paintings such as frescos from the triclinium are missing. What remains is in a good state of repair, so much so that the artist’s signature is still visible on a set of imitation Greek marble wall panels near the atrium. The artist, ‘Alexander’ was clearly a popular Herculaneum wall painter as his signature has been found against other wall paintings elsewhere in the town.